According to Chris & Kyle: They visited a pub in Pennsylvania and were poured a great porter. Right then and there they decided to create a cigar that bore the same tasting profile. Check out a video here of them discussing how to pair cigars and brews. Not much else to find about this stogie - like a lot of EZ's stuff, they aren't too forthcoming with a ton of information. 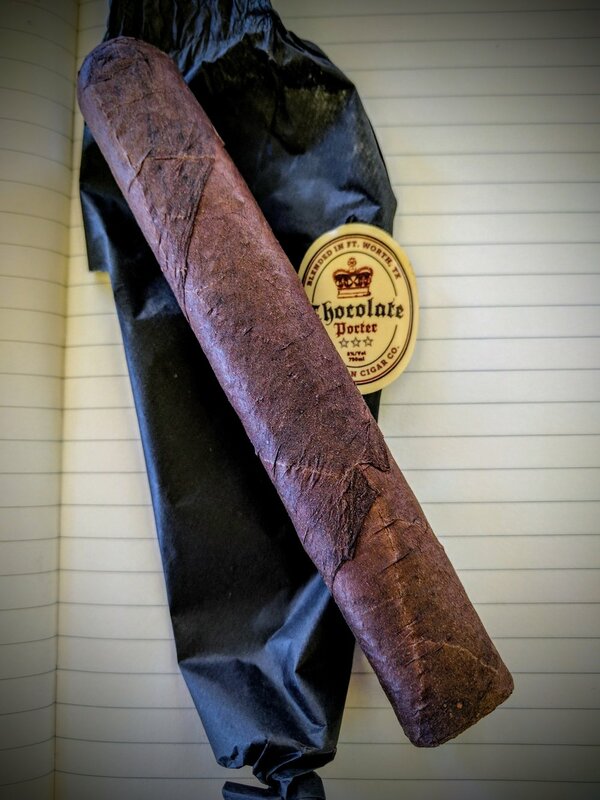 For a cigar themed after a beer, the wrapper and tissue seem to be more in line for a chocolate. The band itself is instantly recognizable as one that may be found on a great English porter but the tissue seems a little excessive and deviates from the theme. I do appreciate the band displaying not only the cigar's name but the brand - it's a rare feat for Ezra Zion! 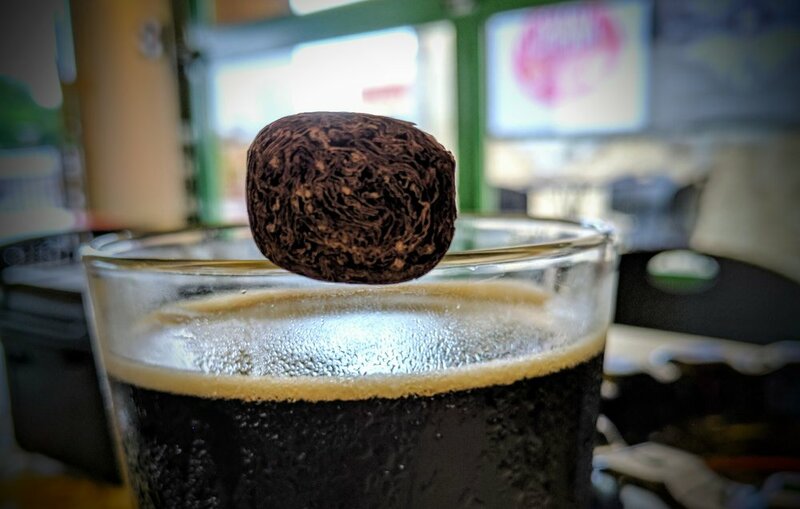 The Chocolate Porter has great rustic quality to it's appearance. The San Andres wrapper is toothy and seems twisted across the cigar. As the name may imply, the wrapper has a dark chocolatey color to it. There are no veins visible and the seams are expertly done so that they fade from view. The wrapper is blighted by a handful of blemishes. No concerns - just unsightful. A light inspection turned up some hard spots but no real soft spots. The box-pressed foot showcases the blend with a color variation very reminiscent of the head on a porter. The cap is very nicely done for a box-press with a deep shoulder and seamless transition into the body. A whiff of the foot brings to mind cocoa and stone fruit. There's also some faint tea or coffee notes. The draw is a little closed and offers a touch too much resistance. Immediate flavors to note are cocoa, sugary coffee and dried apricots/cherries. I clipped the cap off with my Xikar XO and fired it up. The draw is still tight and it does take a bit more work than normal to get a good steady burn going. Once lit though, the flavors are fantastic - albeit a bit muted. The first flavors to come forward are chocolate with fruit - exactly like this really cool chocolate from Maverick, morropan chocolate. What's cool about it is that the environment the cocoa is grown in produces a chocolate with a fantastic deep stone fruit flavor to it. I highly recommend it - but I digress. There's also some vanilla bean ice cream. The ash is super white but the burn line is fairly eradttc. Smoke production is minimal at each puff. While resting a faint steady stream of smoke rises from the cigar. The first third brings a lot of sweeter notes - milk chocolate, sweet coffee and vanilla. There's a light citrus flavor as well that's faint but definitely noticeable. Pepper is present, although minimal. All the flavors are wrapped up in a mild, creamy unifying profile. The draw is good/open with just a bit of resistance. Burn line is a little wonky but easily manageable. The retrohale is quite smooth and brings out the black pepper. The best description for the second third's flavor profile is espresso with a lemon twist. The pepper is at the forefront now and there's a touch of bitter cocoa. The draw seems to have tightened - making you work a little harder at each puff. At this point, the burn has gotten pretty bad. I touched it up a bit to correct but it seems to have a mind of its own. Meanwhile, the ash was stacking nicely up to about 1-1/4 inches. It has a wonderful marbled look with white, grey and black all present. The final third brings a really interesting flavor - a slightly less sweet toasted pecan pie - or maybe just toasted pecans with light pepper and charred oak. There's some vanilla cream as well. One final flavor as I work to the nub - smoked brisket - very faint but definitely a smoked meaty characteristic. The cigar burns pretty hot as the final inch hits with a burning spicy note. One last, very strange flavor - fragrant French cheese. I know that's weird and I haven't really gotten that from a cigar before - but there was a camembert-like taste to it - not nearly as gross as it sounds. The flavors definitely move along in the Chocolate Stout - lots of sweet that slowly converts to a peppery complexity. It's not an overly complex cigar and great for when you just want one to burn. The burn on the Chocolate Stout started promisingly enough but as it went the burn needed some attention. A couple touch-ups and a relight dropped the score here slightly. 7.2 / 10 - MISSING THE porter ? Chocolate Porter may be a victim of its name. While the flavors progressed nicely it was hard for me to imagine them as a porter. 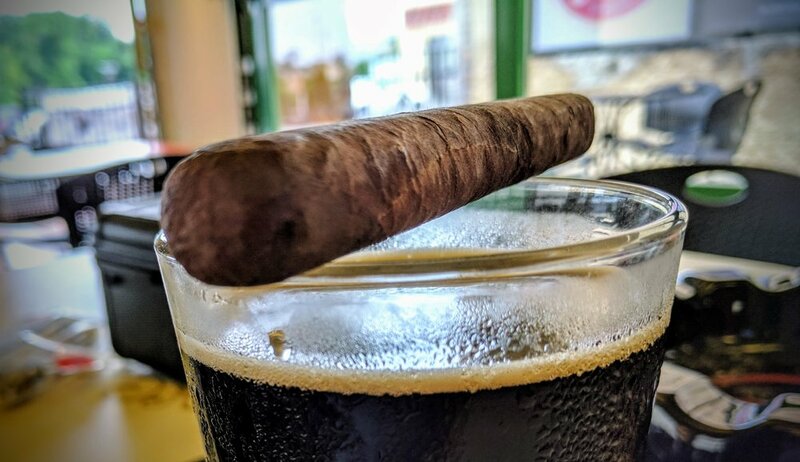 The progression seemed to peak around the first half of the first third as well - which made the remainder of the cigar kind of one note where you're trying to detect the subtle nuances of flavors. Both the sweet and savory flavors were good and unique but overall not as impressive and some of Ezra Zion's other cigars. To me, this is a great daily smoke - but the rarity and price are a HINDRANCE to that notion.